Ted Cruz and Marco Rubio have unleashed a barrage of attacks on front-runner Donald Trump in the last Republican debate before Super Tuesday. They sought to blunt Donald Trump’s momentum after he won three of the first four contests. 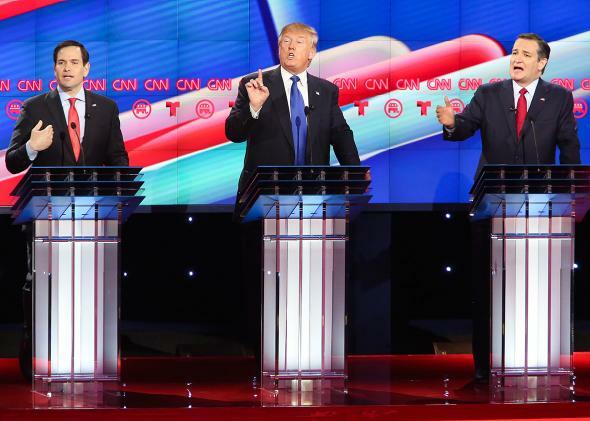 Immigration, healthcare and outreach to Latino voters dominated the debate. Like previous occasions, the debate quickly disintegrated into long periods of shouting and personal insults. Donald Trump has been extremely popular despite his controversial comments about deporting millions of undocumented workers and banning Muslims from travelling to the US. On March 1, known as Super Tuesday, millions of voters in 11 states will cast ballots. A quarter of the total numbers of delegates needed to secure the GOP nomination will be up for grabs. Donald Trump is currently leading in 10 out of 11 states holding contests on Super Tuesday. He has 82 Republican delegates, Ted Cruz has 17 and Marco Rubio has 16. To become the GOP’s nominee, a candidate has to have 1,237 total state delegates. On the Democratic side, Hillary Clinton and Bernie Sanders will compete for 1,004 delegates on Super Tuesday. So far, Hillary Clinton has 505 delegates and Bernie Sanders has 71. Each party formally announces its presidential candidate at conventions in July, four months before the presidential election.